Equitrekking’s host Darley Newman cowboys up to explore Texas Hill Country, Fort Worth and North Texas, riding with modern day cowboys to learn about Texas horse culture. At Wildcatter Ranch, Darley attempts to feed giant longhorn cattle, before driving a wild group of fresh cattle across a stream. 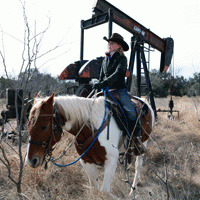 Equitrekking helps viewers explore the rich oil history of this area of Texas with guide Jay Brewer, who gives a genuine feel for this area where he grew up and that he loves dearly. Since everything is bigger in Texas, Darley learns how to season a big Texas steak- the best part being the taste test- at Wildcatter Ranch’s restaurant. In Texas Hill Country, Darley rides at two different ranches to experience the trails in the Hill Country State Natural Area, a popular place for locals and visitors to trail ride. Then, Darley travels to Fort Worth to attend the Fort Worth Stock Show, see the twice-daily cattle drive through the city streets and visit the National Cowgirl Museum & Hall of Fame.